From Martha Stewart to Arianna Huffington to Dennis Crowley (Four Square) and others, here’s a video of some thoughts on how these high-profile folks find creative inspiration. There are some interesting commonalities. Most interesting is the dynamic between getting away versus bouncing ideas off others. Came across this article about how current measures aren’t addressing wrong site surgeries as much as hoped. So it got me to thinking that perhaps something like the below solution could be used to help minimize these adverse events. 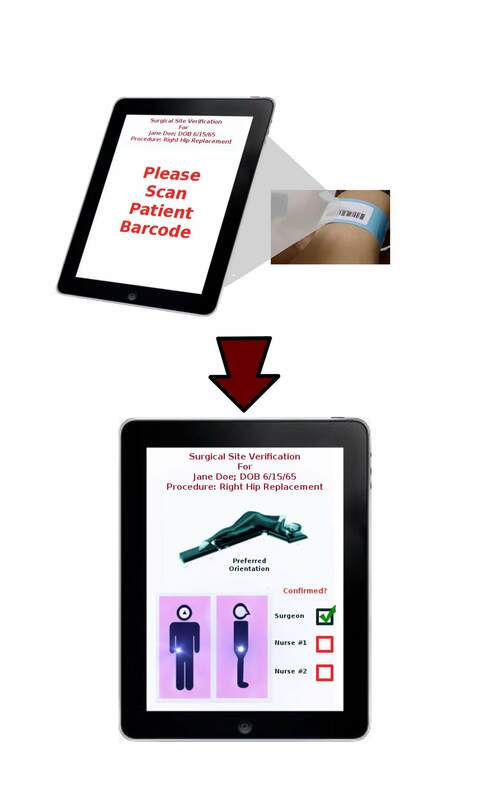 The patient’s bar code is scanned and the surgery team is presented with the preferred orientation of the patient for that surgery, and the location of the surgery on the patient. Three people, including the surgeon, have to cross-check the patient with the information presented. When all check boxes are filled, the surgery can proceed and hopefully at the proper site. Tim Thompson has developed an amazing tool for making music….and more. Using the Kinect system by Microsoft, Tim’s “Multi Multi Touch Touch” device (The Space Palette) is an awe-inspiring piece of work. Can you think of any other innovations that have these traits? Some excellent observations and thoughts on Creativity. It’s not very long, take a few moments to listen to his perspectives. Observe>>Reflect on the Experience>>Act on the Insights(=Design Solutions). Richard W. Sears, founder of Sears Roebuck, lived by that process. His goal was to make life simpler for people and make a profit doing it. In the 1880’s as the country was adopting and making sense of time zones (from 300 to four), Sears sold watches to rail travellers. People who before had to calculate the time by looking at the sky and deduct or add a minute for every 12 miles traversed, depending on the direction being travelled. His focus on making life easier for his customers is epitomized by this blurb in his 1908 catalog which made it clear that people didn’t have to be intimidated by the mail order process. Don’t be afraid you will make a mistake (on your order). We receive hundreds of orders every day from young and old who never before sent away for goods. Tell us what you want in your own way, written in any language. We have translators to read all languages. Observation: People placed their catalogs and books on coffee tables. The books were often stacked when the house was cleaned. Reflection on Experience: The Sears catalog had to compete with the Montgomery Ward catalog for space. In order to get noticed, somehow the Sears catalog had to differentiate itself in some way. As printing techniques for the catalogs were relatively simple, Sears took an entirely different route to differentiate his catalog. Act on the Insights: He made the catalog smaller than the Montgomery Ward catalog so that when the catalogs were stacked on the coffee table, the Sears catalog would be placed on top. Building an empire is actually quite simple. Don’t just observe a situation – contemplate it.